At the North Country Children’s Museum, we believe that learning is a hands-on, minds-on, interactive experience. 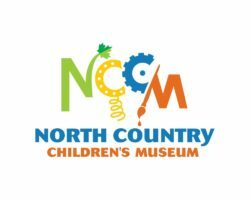 With exhibits that celebrate the cultural and geographical resources of the North Country, you’ll find play areas and tinker spaces for all ages to get kids thinking, making, and doing. Build and balance in our Construction Zone or run the store in our Kids Co-Op and Bakery. Explore the Raquette River in our Adirondack Water Play exhibit or light up your mind with our STEAM Power everbright art wall and engineering lab. Our Playspace, especially designed for crawlers, toddlers and preschoolers, gets little ones moving with sensory and imaginative play. Come play and learn with us!